Olivier Messiaen was perhaps the most influential French composer since Debussy. He redefined avant-garde, although his highly original works often reflect conservative values of spirituality, nature, and beauty that set his music apart from the harsher trends of the 20th century. While others “musicalized” the harsh mechanized sounds of urban life, war, and the industrial age, Messiaen preferred nature, and most of all, birds. As a passionate ornithologist, he painstakingly transcribed birdsongs, particularly the songbirds of France. Birds were the true musicians, he felt, and their songs were transformed exquisitely in his music, as seen in Catalogue de Oiseaux (1958). 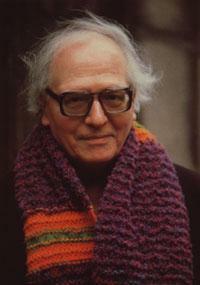 Messiaen enjoyed a happy childhood filled with music and poetry. At age 10 after discovering Debussy he declared his intention to become a composer. His mother penned a long colorful poem to him before he was born, and the synaesthesia which caused the composer to experience sounds as colors (as did fellow composers Rimsky-Korsakov and Scriabin) he attributed to her. “When I hear music, I hear colors,” he said. “When I compose, I see the colors as I see the sounds.” He described one of his harmonic sequences as changing “from blue striped with green to black spotted with red and gold, by way of diamond, emerald, purplish-blue, with a dominant pool of orange studded with milky white.” (Once he got a stomach ache at a ballet when the violet lighting clashed with his color conception of the Key of G!) His father, a teacher of English, translated Shakespeare into French. As a child, Messiaen delighted in adapting Shakespeare plays for family productions. Considering that Shakespeare wrote more about birds than any other poet, is it any wonder that birds would sing in Messiaen’s music more than in any other composer’s? Messiaen’s deep spiritual faith was akin to Bach’s. Both felt that the essential goal of music was to glorify God. “I want to write music that is an act of faith, a music that is about everything without ceasing to be about God,” declared Messiaen. When his faith was tested during his 2-year captivity in a German POW camp, he composed his most important work Quartet for the End of Time (1941). Written for piano, clarinet, violin and cello–the only 4 instruments available to him in the prison camp, this intensely mystical work had a profound effect on 5000 fellow prisoners in the camp, where it was performed for the first time. Messiaen’s compositional innovations included the use of Greek meters, Hindu rhythms, rhythmic palindromes, adventurous harmonies, and a vivid use of color in his orchestrations through unusual percussion such as the ondes martenot (a vacuum tube instrument that was successor to the spooky theremin). He also briefly experimented with electronic music (Fête des belles eaux, 1937) and serialism (Quatre études de rythme, 1949). His legacy includes works for organ, piano, voice, orchestra, and an almost 6-hour-long opera (Saint Francois d’Assise, 1975-1983). He was in ill health when he finally completed what he thought would be his final work, but how fitting is it that St. Francis is the subject of his only opera. (Hear St. Francis’s ecstatic sermon to the birds, Act II, Scene 6). In this gentle saint Messiaen found someone who quietly worshipped God and passionately loved nature and birds as much as himself. This poetic children’s biography reveals the small miracle of how French composer Olivier Messiaen wrote his most important work, Quartet for the End of Time. Imprisoned in a German POW camp, Olivier longs for his family, friends, and home. . .but most of all he misses music. A chance encounter with a nightingale and a German officer, however, provides him with the opportunity to write music again. When a make-shift concert on broken-down instruments takes place in the camp in 1941, Quartet for the End of Time (and the song of the nightingale which is in it) offers a message of hope and beauty that inspires Messiaen’s 5000 fellow prisoners.